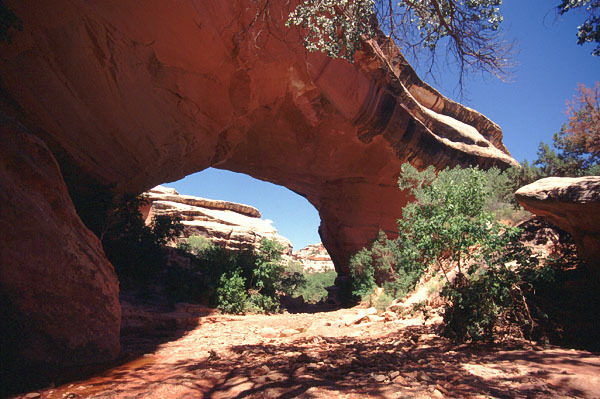 Kachina Natural Bridge is the second largest of three large meander natural bridges in Natural Bridges National Monument. In the past it was on our list of the longest natural arches over 200 feet because of its reported span of 206 feet. However, in 2007 it was measured by Jay Wilbur and Craig Shelley using precision laser rangefinding at 192 feet ± 1 foot, so it was removed from that list. See the listing for Sipapu Natural Bridge for more information about this area. Photo by Jay Wilbur. See also Jay's web page on this arch.